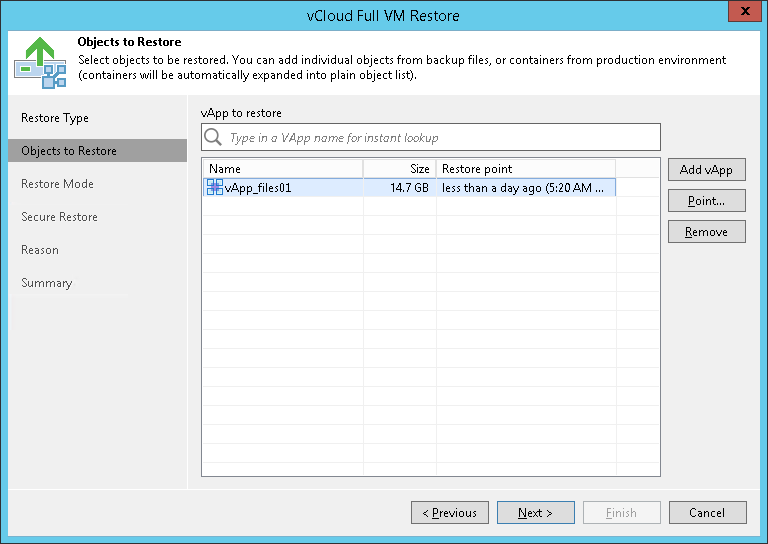 At the Objects to Restore step of the wizard, select the vApp you want to restore. From infrastructure — browse the vCloud Director hierarchy and select a vApp to restore. Note that the vApp you select from the vCloud Director hierarchy must be successfully backed up at least once. From backup — browse existing backups and select the vApp under backup jobs. To facilitate selection, use the search field at the bottom of the Select VMs window: enter an object’s name or a part of it in the search field and click the Start search button on the right or press [ENTER]. Enter a vApp name or a part of it in the search field. Veeam Backup & Replication will search existing backups for the specified vApps and display matching results. To add the vApp to the list, double-click it in the list of search results. If the necessary vApp is not found, click the Show more link to browse existing backups and choose the necessary vApp. To remove a vApp from the list, select it and click Remove on the right.